Can you think of a NAS worth buying that costs less than $150.00 USD? I bet you would have a hard time answering that question. I have reviewed a slew of NAS and can’t answer that question, until now. Thecus has done what many have considered as the impossible. They may have just set a new standard for affordability, slapped the Thecus badge on it, and dubbed it the N2310. The N2310 is not going to set any LAN speed records, but it will introduce you to “a whole new world”. Sorry… bad Alladin reference there. Anyway. To get some quick information out-of-the-way. The N2310 is a two bay NAS that measures in at just 135 x 97 x 207 (mm) and just 1.8 lbs. This tiny little box supports hard drives up to 6TB in size and can support RAID 0, 1, and JBOD. The N2310 is powered by an 800MHz processor, sports 512MB of RAM, and consumes just about 5W of electricity. 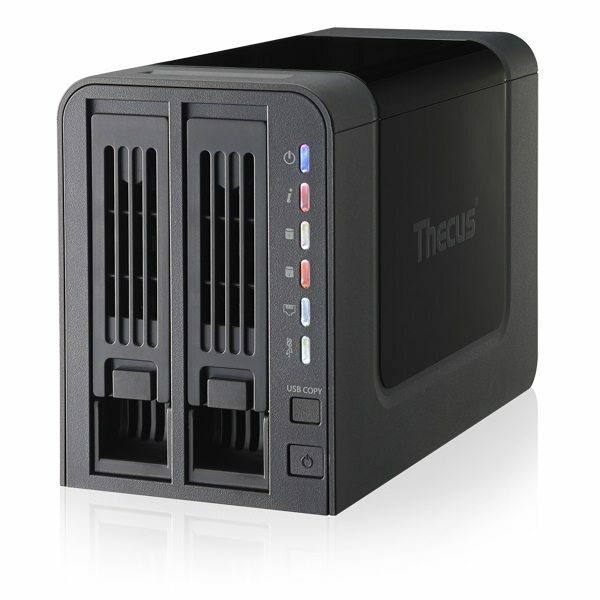 The N2310 runs Thecus NAS OS6 and provides many of the features and functionality found in much more expensive options. 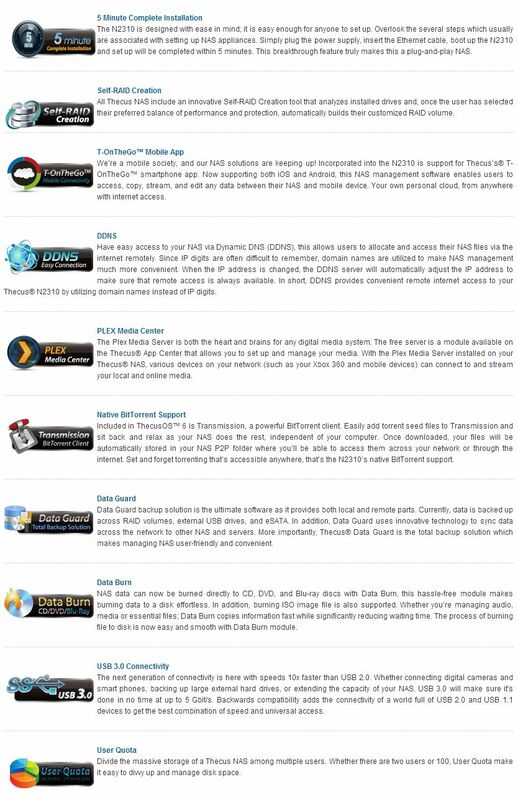 Thecus NAS OS6 brings things like Web-based file access, FTP server, BitTorrent clients, Plex, Mobile Apps, Self RAID creation, and plenty of modules to extend features even further. Fighting in the lightweight division, there are some features missing. First, this NAS does not feature an HDMI port for direct connection in your home theater. Second, don’t expect to get iSCSI support or dual Ethernet connections. Lastly, plastic… everywhere, no brushed aluminum or metal garnish.